Christmas isn't a traditional holiday in Thailand, but it's becoming more and more popular, especially in Bangkok. Thailand is primarily a Buddhist country and though there is a small minority of Christians, most of the holiday revelry is purely secular. Most Thai families do not celebrate Christmas with a tree and gift giving on December 25, but many do acknowledge the holiday, or at least the holiday season, in other ways. Lucky for visitors and foreign residents, that means that in Bangkok you won't feel too far from home when December rolls around. Every large mall in the city will be decking its halls in time for Christmas. In central Bangkok, do a little walking (or Skytrain riding) tour of some of the best-decorated shopping centers. Central World, the massive shopping mall in the Ratchaprasong area, has a gigantic Christmas tree in the front plaza area, with an open beer garden just next door. Inside the mall, there are also plenty of Christmas decorations to enjoy, including another large Christmas installation inside the mall's seven-story atrium. Diagonally across the street on Rama Road from Central World is Amarin Plaza, which also puts out impressive Christmas decorations. Paragon Mall, just a couple of Skytrain stops away, decorates its plaza with lots of lights, Christmas trees, and other traditional holiday animals and scenes. MBK Mall, a short walk from Paragon, is also known for its outdoor Christmas decorations, which often end up scaling the side of the mall. Though the fairy lights around the Chitralada Palace weren't put there to celebrate Christmas, they are enchanting and beautiful and worth a look. Take a walk around the neighborhood in the evening, and then head over to the Grand Palace compound to view the buildings lit up at night there, too. No matter what the craving, Bangkok will have a dining establishment to satiate the urge. Many of the city's five-star hotels, including The Peninsula, the Mandarin Oriental, and other fancy hotels on the river have gala dinners and buffets for Christmas. If eating at a fancy restaurant doesn't appeal, many of the city's pubs also make holiday dinners that are much less expensive and more casual. While the ambiance may not feel like Christmas, the street food fairs are always a great option for an inexpensive and tasty al fresco meal with authentic Thai tastes like chicken rice, seafood soup, and stir-fried noodles. If you have children and will be in Bangkok over Christmas, you'll probably be hoping to find Santa. The good news is that he does make his way to Southeast Asia every year and can be spotted at various family and children's events. Kris Kringle can be found at the K Village Christmas Market and the Nameebooks Learning Center. Santa often appears at the larger, high-end malls in the city but make sure to call or have your concierge call to confirm when he will be there. 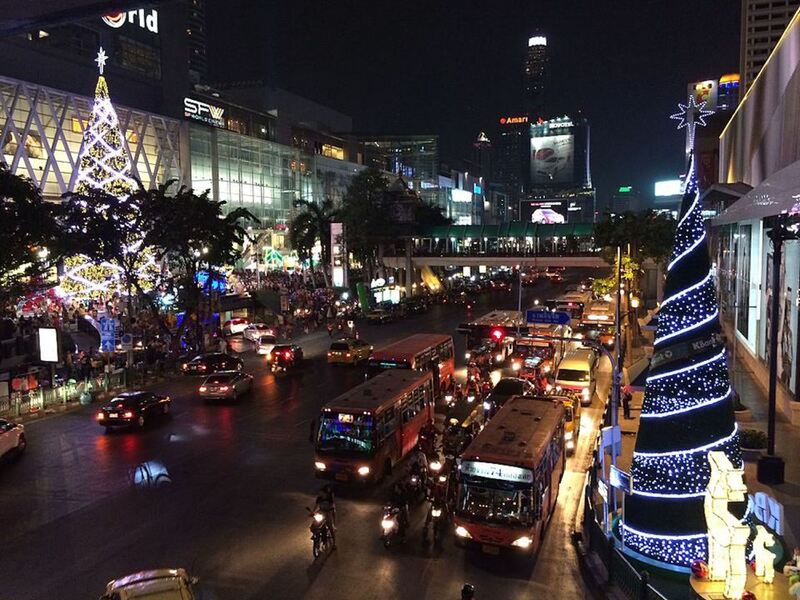 One Christmas activity that Bangkok excels at all year long is shopping. During the holiday season, just about every big retailer in Thailand will be running promotions and holiday sales making it a great time to grab a deal. Almost every mall offers gift wrapping services that will save you time and effort upon returning home. If you're concerned about customs inspectors needing to view the contents, the gift wrappers can leave one side open so the items can be reviewed without ruining the wrapping job. A more chaotic (but fun) location for shopping is the Chatuchak Weekend Market. One of the world’s largest outdoor markets offers Thai silks, handicrafts, clothing, and plenty more to find the perfect souvenir.